Mexico City aka #CDMX is the 17th largest city in the world, and is full of rich history, from the Aztec, to the Spanish colonials and now, the modern world. 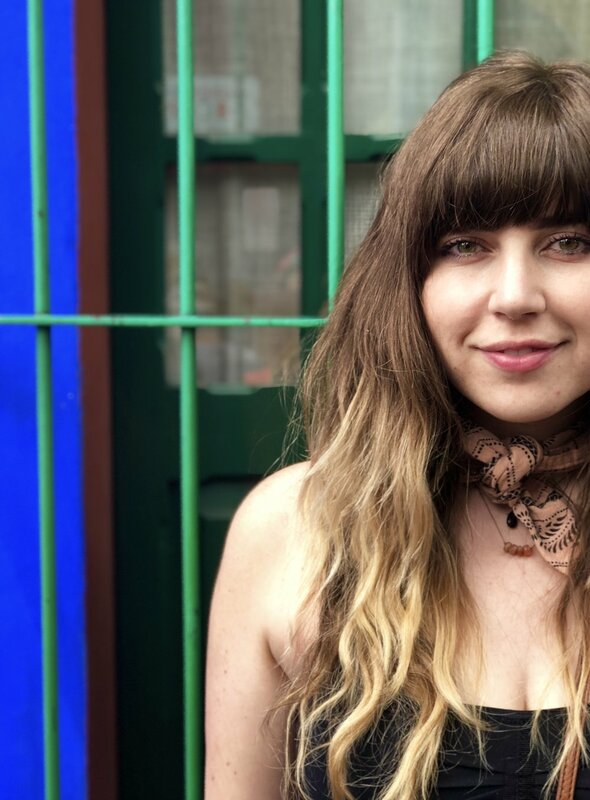 Regardless of what you’re looking for, you will likely find it in one of the many unique neighborhoods in the city (I’m partial to the Condesa and Roma neighborhoods). This includes phenomenal cuisine, archaeological sites, museums, lucha libre wrestling shows, live music, boutique shopping, street vendors, and much more. It’s impossible to see it all in a lifetime, let alone in one day. But we’ve created a list of our favorites, so that you can design an itinerary that’s right for you! A couple of tips: First, Mexico City sits at over 7,000 ft in altitude, so give yourself at least a day to acclimate before climbing any Aztec pyramids or heading on a shopping spree. Also, there is plenty of public transportation in this city, but I found Uber to be the most convenient and well-priced option to galavant around the city. I also found the bus system great for long-distance travel. By far, my favorite indoor spot to sit and sip on hot coffee, and do computer work. And apparently a lot of others feel the same. Super hip, and funky with good music, good drinks, and alternative milks. It’s in the Condesa neighborhood… Of course. One of my favorite outdoor spots to sit and have my daily cup of coffee, and here the computer work follows me too! Another trendy spot with great drinks, and the lighting is amazing. Plus, they sell records. Once again, in the Condesa neighborhood. Sensing a vibe? 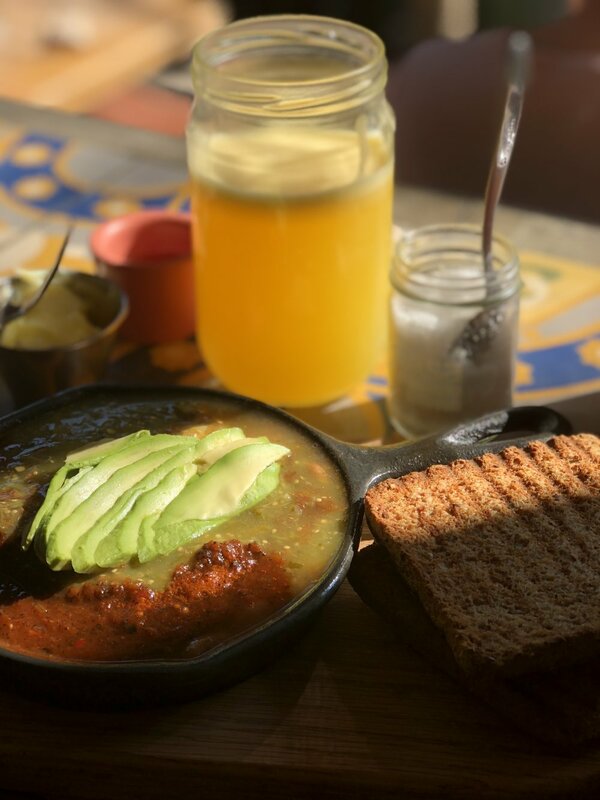 Located in the La Roma/ Condesa neighborhoods of Mexico City they have tons of organic gluten-free and vegan menu options, as well as fresh blended juices. Their market even sells organic produce and treats like chocolate covered almonds. Take me back! My stomach misses it a lot. 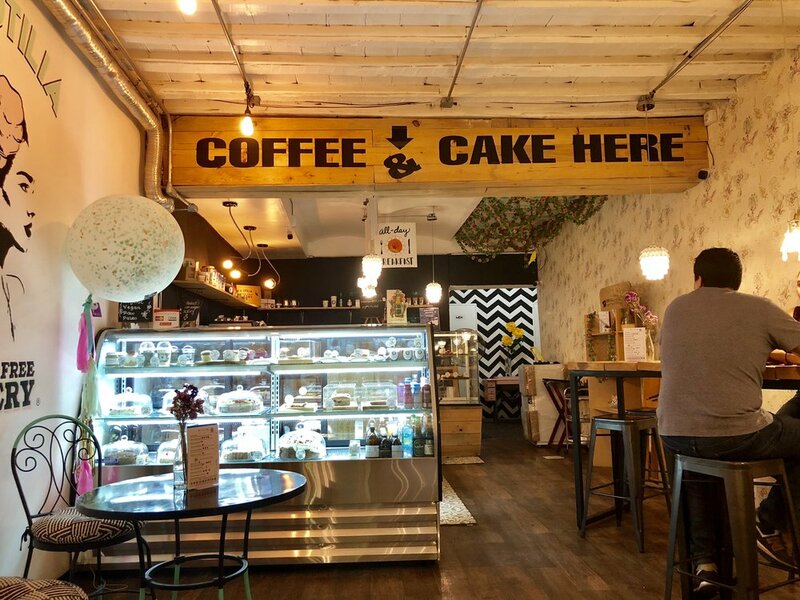 A 100% gluten-free cafe and bakery! I thought I was dreaming when I walked in and saw that everything is gluten, dairy and sugar-free. Yes, you read that correctly. They have an entire menu full of scrumptious options, plus a bakery full of cakes, cookies, donuts, you name it. A public market with gourmet food stalls. There is literally something for everyone to browse and eat. Open for lunch and dinner. A hip vegan restaurant in the Roma Norte neighborhood with plenty of gluten-free dishes available. Open for lunch and dinner, I was happy my friends recommended it, because it’s delicious. Don’t just take my word for it — here’s a great write-up on it by the Guardian. One dish. Oaxacan cricket pizza. Gluten-Free. Dairy-free without the cheese. Do it. The end. A famous upscale restaurant, known for their traditional Mexican dishes and gorgeous interior. The kitchen staff was quite accommodating, and even the chef spoke to me about my dish. They have two locations, one in the historical center and one in the Condesa neighborhood. P.S. Contrary to popular belief, most molés have gluten in them. Rated a top restaurant not just in Mexico city but the entire world, due to its incredible menu and jaw dropping interior architecture, this upscale hotspot will not disappoint. And yes, they can accommodate any diet. Be sure to make a reservation if you decide to go! This was across the street from the hotel we were staying, and naturally we ended up spending a few evenings hanging out there. I had the pleasure of serendipitously seeing La BRUJA de Texcoco perform. This is a great go-to juice fix spot. You can get basically anything blended, or mixed. They have a large menu, and even sell breakfast. A public contemporary art museum in the city, hosting internationally famous modern and contemporary art and exhibitions. If the art doesn’t excite you, then the architecture of the building definitely will… not to mention, the gift shop. Ready to watch an exciting Mexican Lucha Libre wrestling show? Well, you’ve come to the right place. Regardless of which evening you decided to go, you WILL BE entertained by dramatic costumes, masks, and flopping bellies. A cultural center, and a gorgeous building. They host art exhibits, and events in music, dance, literature, theatre and opera. You have to see this place in person, and be sure to check out which events they are hosting while you’re in town. The largest and most visited museum in Mexico, for good reason. Where else can you see the Stone of the Sun (the Aztec calendar stone) in person? This museum has all of the pre-columbian anthropological and archaeological artifacts your heart desires. Imagine if the Matrix had a physical library. It will feel like you took the blue pill, because this is the coolest library you will ever visit (and not just because I’m a librarian). Home of the famous architect, Luis Barragan. They also host various exhibits. You can explore this beautiful art, with all of its intricacies by appointment only. Everyone wants a photo of, or inside one of these floating gardens. The neighborhood of Xochimilco is comprised of over 50 canals and trajineras (gondolas), that you can ride for about an hour as you enjoy food, drinks, music and the views. It’s a pretty cool experience. We had an amazing tour of the historical center, thanks to our lovely tour guide, Bernardo. 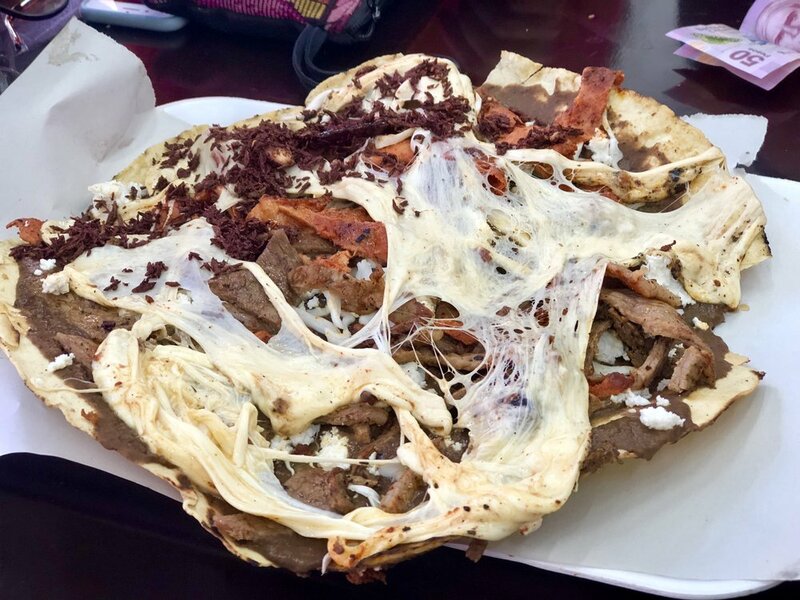 Born and raised in the city, he is quite knowledgeable and gave us different perspectives on the history and culture of the city, complete with introducing us to that Oaxacan cricket pizza. This public park, located in the Condesa neighborhood, is huge, and there is always something going on. I loved that we were simply strolling through on a Thursday evening, and saw a group dancing tango, and next thing we knew, we got pulled into it. I was happy to practice my rusty Argentine moves. It’s just a magical place to walk through if you have the time. This has been a dream of mine to visit, but I have a couple opinions regarding my experience The photos do not lie. The colors are truly that vibrant. Being able to see where Frida lived, worked, loved, suffered, slept, etc. was pretty surreal. And her clothing exhibit was also quite awesome. The cons are that this was one of the priciest museums to enter that I encountered in CDMX (around $15). And if you do not buy your ticket ahead of time, you may have to wait around two hours in line. Even then, they may sell out. Unfortunately, this has happened to numerous people I know. Even if you do buy your ticket in advance, expect to wait in line a for a good half-hour. Luckily, the amazing blue backdrop will serve for some awesome photos as you wait. Once you enter, you must pay $1.50 per device to take a picture. They will give you a sticker, and if they do not see it, you will be scolded. Technically, you could give the sticker to a person waiting in line though. Another thing that diminished my experience was how crowded it was. Even with the limited amount of people entering, you sometimes have to wait in line to take photos in front of different spaces, or simply wait to see something specific. My biggest tip is to buy your tickets ahead of time and temper your expectations. Also, look for the guy slinging coconuts on the corner. The water will cool you off, especially if you are visiting on a warm day, and the freshly sliced pieces of coconut meat topped with chile y limon never tastes so good. This pre-Christian ancient mesoamerican city and UNESCO historical site is about an hour away from the city, and a must-see while visiting. You can either go with a tour, rent a car, or pay a few dollars for a bus ride. I find the long-distance bus system in Mexico to be completely awesome. And these ruins are well worth the trip! I was ready to stop by here on Record Store Day, and it was packed! With a comprehensive selection like most modern record stores, you can easily find your favorite Mexican artists, like Natalia Lafourcade. High-end and eclectic beautiful fashion by local designers. I had a great time just window shopping in here. An adorable clothing store which carries primarily local brands, located in the Palacio de Bellas Artes. Located nearby Frida Kahlo’s home, in Coyoacan, a colleague’s friend took us to this market, and there is so much to see, buy and eat. Run by local venders, you can find both local artisan products and traditional street food. I love visiting markets in countries I visit. Usually, because I prefer to read the packaging and cook with ingredients I can see. This market has organic produce, and various complementary products. I was able to get my kombucha and probiotics fix there, as well as pick up snacks. This same company has stores in various markets, and even a restaurant in Condesa. This specific market is located in the Roma neighborhood. A boutique shop in the Roma neighborhood, catering to mostly men’s clothing and gear. Five stories of awesome upscale food and clothing stalls, to commercial shopping, yoga, beauty. End your day with drinks on the terrace. Although Mexico City was greatly affected by September 2017’s earthquake, the citizens have maintained their optimism through community and resilience, and you can witness this first-hand across the entire city.